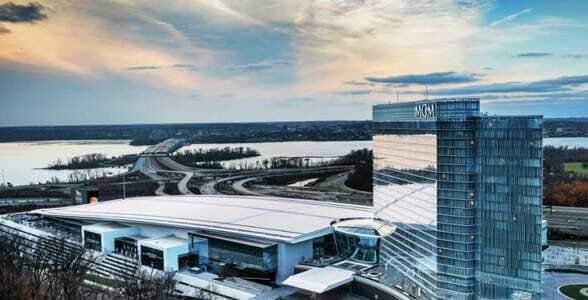 The Short Version: Established along the Potomac River in 2008, National Harbor is a wondrous resort destination surrounded by American history and natural beauty. Over 11 million visitors a year come to the peaceful residential area of Prince George County in Maryland to enjoy a waterfront escape just a few minutes south of Washington D.C. Couples flock all year round to the picturesque city and enjoy boating, shopping, wine tasting, and other fun activities along the shore. From upscale restaurants to a towering ferris wheel, National Harbor was built to entertain visitors. You can book your stay at the Gaylord Hotel or MGM’s casino resort to enjoy a luxurious and intimate atmosphere with someone special. 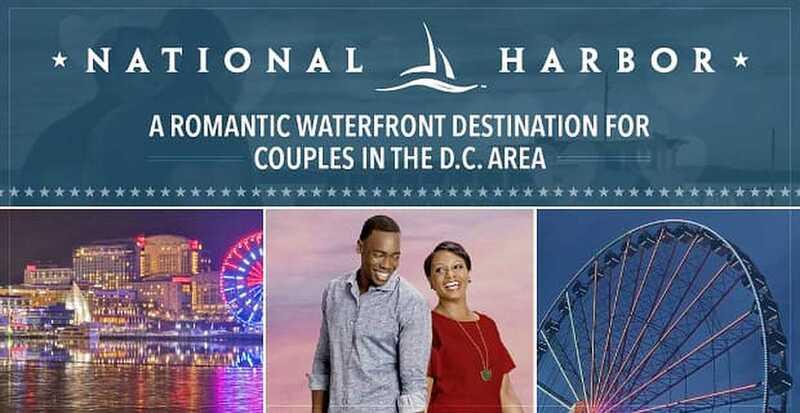 For daters who want to see the capital while on a romantic retreat, National Harbor provides the perfect balance between sightseeing and relaxation. The water is calm, a shimmering mirror of blue skies and sunshine, as couples and families stroll along the marina. At the northern end of the street, a 180-foot ferris wheel sweeps people up into the sky to look out over the sprawling D.C. landscape and tranquil Potomac River. This is National Harbor, a waterfront city built to delight visitors with gorgeous views, luxurious hotels, and scrumptious eateries. The simple layout of the city makes it easy for newcomers to navigate their way from shopping along Waterfront Street to bar hopping down Fleet Street. Though National Harbor only takes up 1.25 miles of the Potomac, the city’s builders have packed a lot of fun into the property. From free outdoor movies to extravagant wedding venues, the Maryland destination has something wonderful around every corner. Since 2008, National Harbor has invited visitors to experience the beauty, history, and wonder of the Potomac River and surrounding D.C. area. The friendly harbor offers a convenient escape from the crowds and traffic of Washington D.C. Treasured American landmarks, like the National Mall and Mount Vernon, are just a water taxi away from National Harbor. 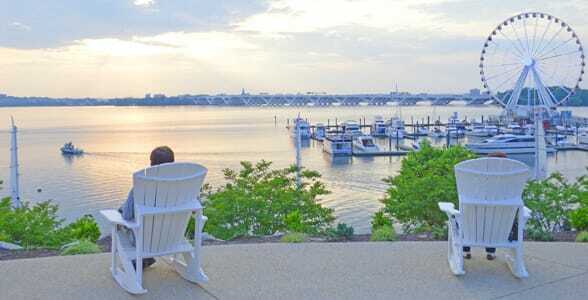 You can rent a boat or car and be in the heart of D.C. in minutes, or you can stay in the more intimate quiet of National Harbor’s marinas, restaurants, and hotels. Each year, National Harbor sees more than 11 million visitors, a number which will only grow as the destination continues to expand and draw in vacationers from around the world. Whether you and your date enjoy yoga by the water or playing poker in a casino, this lively city has a little something for everyone. National Harbor’s most stunning attraction is the 180-foot-tall observation wheel standing by the majestic Potomac River. The Capital Wheel offers a panoramic view of the nation’s capital from a slow-moving ferris wheel with 42 spacious gondolas. These climate-controlled glass capsules provide a sweeping look at National Harbor and the D.C. area beyond. You can get your tickets online and strap in for an incredible journey. Classy couples can choose the VIP Experience to take in the Potomac sunset from the privacy of their own glass-bottom gondola. Catering options are available as well. Renting this space is a great way to make an anniversary unforgettable. The Capital Wheel remains open all year round and can ferry up to 800,000 passengers per year. Each ride lasts about 15 minutes to complete one full rotation. From Amos Los Tacos to Zizi’s Pizza, National Harbor’s diverse collection of restaurants can please any palate. The website’s date night itineraries recommend Rosa Mexicano, Redstone American Grill, and Fiorella Italian Kitchen as particularly indulgent and upscale eateries for couples. Daters can attend a wine tasting, take an exercise class, or just enjoy the sights at National Harbor. National Harbor offers over 30 restaurants to take a date as well as a vibrant nightlife to enjoy afterward on Fleet Street. Bobby McKey’s is the standout for daters on this street. It’s the only dueling piano bar in the D.C. area, and seats often sell out. If you’re looking for a quieter activity to share with your date, you can make a reservation at Relâche Spa (at the Gaylord Hotel) to enjoy a Side by Side Harmony Massage with your loved one. National Harbor has a little bit of everything for vacationers, from paddle boating to outdoor movies. “During date night movies, you can sit outside on the waterfront and watch movies for free,” Angela said. On Thursday nights in the spring and summer months (when it’s not too cold), you and your date can join dozens of couples nestled together under the stars as a movie plays on the Plaza Screen. Look for upcoming screenings here or check out the event calendar to find out about other fun, date-worthy events going on at National Harbor. 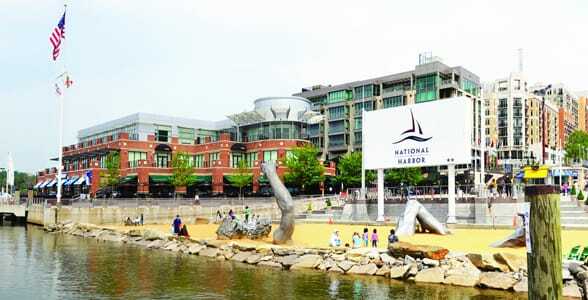 National Harbor offers visitors a respite from the crowds and stress of a typical vacation. Just walking down American Way, a 3,000-foot-long promenade in the heart of the city, you’ll find farmer’s markets, art galleries, and many fun attractions hosted year round. From pirate cruises that are bring-your-own-grog to private wedding receptions hosted by the water, National Harbor offers a variety of memorable ways to spend an evening with someone you care about. National Harbor has seven hotels that provide every comfort for people with a wide range of budgets. By far the most elegant option available is the MGM National Harbor, a casino resort complex built in December 2016. MGM National Harbor is a 24-story, 308-room hotel with high-end retail, gaming, and restaurants. This luxury spot also includes a 3,000-seat theater. Their premium gaming space features 126 table games, 3,300 slot machines, a 39-table poker room, and three lounges. MGM National Harbor’s casino tables and cocktail lounges stay open late for guests. National Harbor provides a romantic setting for daters, especially in their seven grand hotels. It’s no wonder the city is a popular destination for proposals, engagement parties, weddings, and honeymoons. Couples, like Kaitlin and Logan whose proposal on the Potomac went viral, choose to share their special moments at National Harbor’s landmark locations, which now include MGM National Harbor. Ideal for millennial daters, the AC Hotel on Waterfront Street offers some excellent weekend packages that include two signature cocktails at the AC Lounge, valet parking, and gift cards to some of the top bars and restaurants on Fleet Street. Wherever you stay, you’re sure to make some awesome memories at National Harbor. Whether you’re coming for a day trip or an extended honeymoon, National Harbor is packed with activities to entertain visitors seeking a respite from the bustling D.C. area. From where to stay to where to shop, the resort-style destination has everything to make your date nights simple and fun. For daters looking for a romantic getaway, it doesn’t get much better than National Harbor. This up-and-coming waterfront city always has something new on the horizon for visitors. Angela told us the property is only 50% built up and has ample room to add new attractions as time goes by. 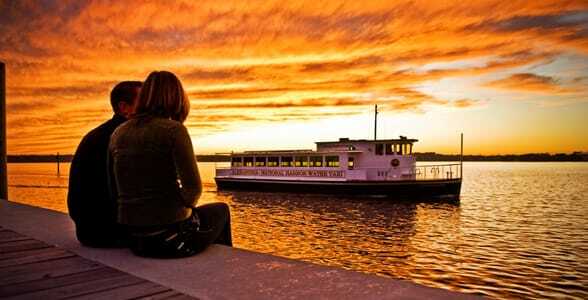 You’ll find tons of fun, engaging, and memorable ways to spend an evening with a date along the majestic Potomac River. From the towering ferris wheel to the upscale steakhouses, National Harbor tempts the senses with one-of-a-kind experiences.